Tag Archive | "Tiger Barb"
The Tiger Barb (Puntius tetrazona), also known as the Sumatra Barb, is a tropical species of cyprinid that is found in Sumatra, Borneo, Cambodia and throughout the Malay Peninsula. Tiger Barbs are found in the clear or turbid shallow waters of moderately flowing streams and in swamp lakes. They are an extremely active, playful shoaling fish that do best in schools of 6 or more individuals. In an aquarium setting they prefer a densely planted tank of at least 30 gallons, with a few rocks and some driftwood. Tiger Barbs need slighty acidic water to breed successfully, but are tolerant to water quality fluctuations. Tiger Barbs are very active fish and will pester or nip at other slower moving fish housed with them. Tiger Barbs are a silver gold to brownish yellow fish with four vertical black stripes on it’s body, and red to orange accented fins and snouts. They can grow up to 4 inches long in their natural habitat but remain smaller when kept in captivity. The Green Tiger Barb or Moss Tiger Barb as it is sometimes referred to, grows to the same size as the native Barb but has a dark green to almost black body. Albino barbs are cream and gold with four barely visible white vertical stripes on their body and red to orange accented fins. Both the Green and Albino Tiger Barb have the same disposition as “regular” Barbs and can be kept together. The highly melanistic green tiger barbs (that reflect green over their black because of the Tyndall effect), the gold tiger barbs and albino tiger barbs are all examples of selective breeding that has been done over the years to emphasize their bright color combinations. When breeding Tiger Barbs, place several specimens in the same aquarium until they pair off. When this occurs, the male will follow behind the female and fertilize the eggs as she lays them. Females tend to spawn several hundred eggs in the early morning hours in clumps of plants. You can expect on average around 300 eggs from each spawn. Once the spawning is completed, the parents will usually eat any eggs they can find, so remove them to another tank. The fry will be free swimming after about 5 or 6 days, at which time they should be fed newly hatched brine shrimp until they are capable of eating finely crushed flake foods. In their tropical environment Tiger Barbs prefer water with a 6.0–8.0 pH, a water hardness of 5–19 dGH, and a temperature range of 77 – 82 °F. Their tanks should be well lit and about two thirds of the tank space planted with ample vegetation for them to munch on and hide in. Tiger Barbs are omnivorous and will eagerly consume processed flake foods and crisps, as well as a variety of live and frozen foods such as daphnia, brine shrimp and bloodworms. They are greedy eaters and can become extremely aggressive during feeding time. When kept in groups of less than 6 fish, they become aggressive and form a “pecking order” or sorts that includes any other fish in their tank. This gives them the reputation for being fin nippers in a community tank environment. For this reason it is not recommended to place Tiger Barbs in with slower, more peaceful fishes like gouramis, angelfish, bettas, or any other fish with long flowing fins. 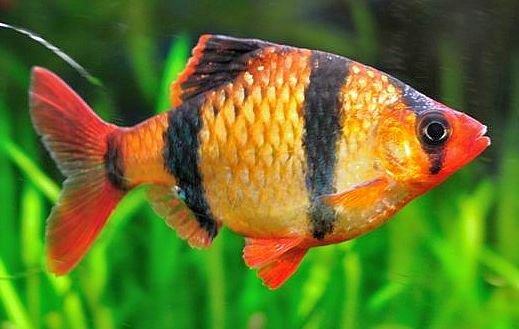 Tiger Barbs can be successfully kept with more active, faster moving fish like platys, danios, Clown Loaches and most catfish. When at least a dozen or so Tiger Barbs are kept in a mixed tank, they will spend most of their time chasing each other and leave the other residents alone. Clown Loaches are an excellent match for Tiger Barbs. They will swim along with the school and mimic the actions of the Barbs.